Smurf: I'm hard on my computer keys…. 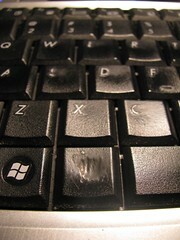 Some of the letters are worn off, and my left alt key has fingernail pits. Smurf: Do you not have letters? Smurf: I no longer have an N. My O is just a speck on the upper left. E is a broken vertical bar, and S is two short curved segments. M, H, R, T and C have the most trouble beyond that, though a number of others have pits and blemishes. A is lame, missing its right leg. Smurf: Oh, and of course left alt is gone, left ctrl is missing pieces. I was just looking at letters. Smurf: Ooh, forgot about my arrow keys. Apparently I'm harder on down than up. Left and right are both more troubled than up, but not almost disappeared, like down. Looks like backspace is having problems, too.